How to install Laravel application? Note: Plesk does not provide an ability to install/manage Laravel application from Application Catalog. It should be installed manually. Note: according to official requirements, it is required to use PHP version 7 or greater. To install Laravel application on a new domain follow the steps. It is also possible to install the application on an existing domain. 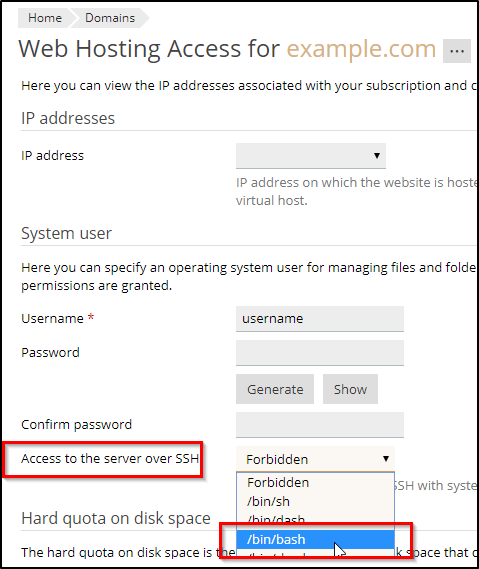 Go to Plesk > Domains > example.com > Web Hosting Access > System user > Access to the server over SSH >and select /bin/bash. Where X.Y - version of PHP handler used on a domain. Note: /opt/plesk/php/X.Y/bin/php is related to PHP handler shipped with Plesk. To avoid using /public you may configure a redirect to this page and use another URL, which is more comfortable for you. I have kept httpdocs as the web root folder but uploaded the app source code in a folder at the same level as httpdocs, then made httpdocs a symlink to the public folder in my app. Seems to work OK, the main issue is having to type in the full path to php and composer everytime I need to run commands as the OS php is recognised outside of the httpdocs folder. And if you do not want to use a full path, and want shell 'php' to be '/opt/plesk/php/5.6/bin/php', not /usr/bin/php, you can create a shell alias for that. Excuse me but I cannot change the option on "Access to the server over SSH". It is fixed on "Login prohibited" option. What should I do? the solution you mention regarding redirection is not really recommended. For safety reasons, the DocumentRoot should be set to that /public directory: https://laravel.com/docs/5.7 (Section public root). Otherwise, visitors might have access to some of the application's core directories which is not intended! Thanks @Nikita. But does that mean Laravel can only be install in Plesk hosting through Linux?